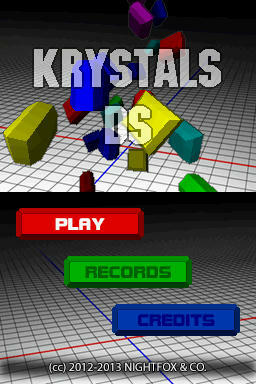 Krystals DS is the review of the first game I programmed for Nintendo DS. 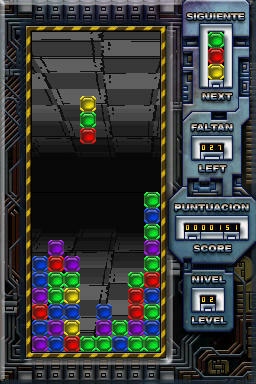 Using PAlib, Aslib and devkitPro R19 (Summer 2008), the game was developed in three weeks, participated in the Neo Compo of that year, remaining in 7th place. The problem is that both versions I used of PAlib and Aslib accumulated several important bugs, combined with the evolution of flashcards and that was compiled with a very old version (and modified) of libnds, has resulted in most of current flashcards play wrong with the best, very bad in most flashcards or directly or work on some. As this year I had little time to devote to new Ds things, I decided to redo the game from 0, using my library, the latest version of libnds and program it in C + + to test to see how it behaved in DS (both library and other DS games are programmed in C). Playability are also new, being more difficult to perform combos, since we will never have a piece with two gems of the same color. The main objective of the game is to create groups of 3 or more gems of the same color in any direction. A greater number of stones removed in the same movement, more score. Your mission is to get as many points as possible before reaching the last level of the game (25). 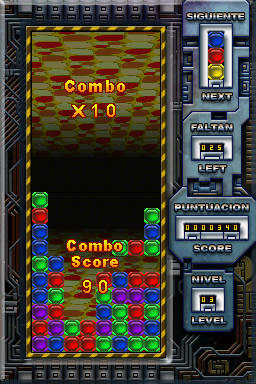 After the game, the score will receive bonuses for the level achieved, the maximum combo made and if you've reached the last level of the game. Use the special gems to make better combos. The diamond-shaped gems, change the color of the gems touched by his. If a diamond-shaped gem touches the ground, all the gems change color randomly. The white gems are also special. If a white gem touches itself to any other gem, all gems of that color will be eliminated. If a white gem touches the ground, the elimination of all the gems from the board. [NDS] Krystals DS - Bugfixes. hardware. (It never happends on emulators). Nice carpet music too! The background behind the falling blocks sometimes has some flickering lines, but that's barely noticeable. Yeah, it's all my homebrews are using NitroFS from Navy Wars. By the way current version has a bug that causes game hang sometimes. I fixed it and will upload the new version as soon i can. * Totaly rewrited all routines of gem elimination. This will bugfix some extrange hangs and improve stability.